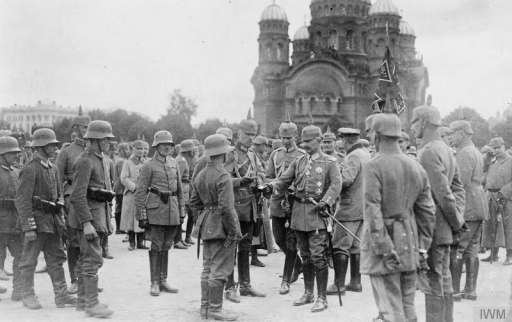 On August 5, 1915, after almost one hundred years of Russian rule, the German Army captured Warsaw. The fall of Warsaw marked the latest in a series of victories for the Central Powers which had started with the Gorlice-Tarnów offensive in southern Poland in May 1915. Its capture was followed by a major Russian withdrawal, aimed at preventing the risk of encirclement. The capture of Warsaw was featured before in the article The Kaiser and the Cameraman (2010) by Cooper C. Graham on the experiences of Wilbur H. Durborough at the Eastern Front in 1915. 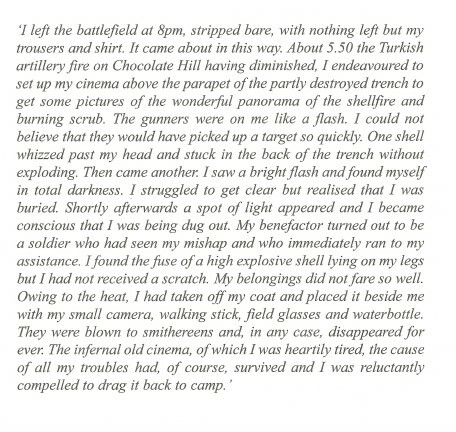 In this article, Cooper described how Durborough and his camera operator Ries filmed Warsaw, shortly after the city had been taken by the German forces. For their movie On the Firing Line with the Germans they captured scenes showing fresh German troops moving through the main streets, the Alexandrovski Bridge, pontoon bridges built by the Germans across the Vistula, Zeppelins flying over the city, as well as scenes showing the Jewish Quarter in Warsaw. As mentioned before in this weblog, Durborough's film was recently restored by the Library of Congress and is now available in the public domain. Although Durborough's film doesn't show any evidence of this, the German occupation of Russian Poland turned out to be a highly controversial subject. Under German rule Poland was reordered and put under tight military control. The Germans however failed to regulate Warsaw’s economy, and as a result the cost of living increased by about 600 percent during the German occupation. This weblog by Courtney Blackington has more information on Warsaw in 1915 and the German occupation, with some references to Cooper Graham's article for Film History journal. Although numerous contemporary World War I films have been lost a lot of footage has also been preserved because it was recycled into TV documentaries. During our latest research for our book American Cinematographers in the Great War we came across some striking examples showing how historical film scenes could be retrieved and identified this way. This recycling process took place as early as during World War I.
Wilbur H. Durborough's film On the Firing Line with the Germans, which was restored by the Library of Congress in 2015, offers an interesting example. Because of the restoration we were able to reconstruct the original edit from 1915. Scenes from Durborough's feature documentary film turned up in U.S. Signal Corps footage, as well as TV documentaries on the Great War by the BBC, CBS and the recent Armageddon series on World War I. We were surprised to find out that as early as during the Great War the Germans used scenes from Durborough's movie, showing the attack by the German army into Russian Poland, which he accompanied on the Eastern Front. In a contemporary German World War I film, produced between 1916 and 1918, we found scenes that were supposed to show Field Marshal von Hindenburg's victorious campaign at Tannenberg in August 1914, which rescued East Prussia from the invading Russian army. Part of the footage however, especially the scenes showing German infantry jumping across ditches, was culled from reels 7 and 8 of Durborough's film which wasn't taken until a year after Von Hindenburg had directed his famous battle. The Germans apparently were so pleased with Durborough's film that they used it anyway for their own purposes. Ironically, the infantry charge scenes shot by Durborough and his camera operator Ries were probably staged at a training ground near Berlin or Hannover. Click here for a new and extended article on Durborough's photographic work during World War I and the making of his film On the Firing Line with the Germans (1915). The original film can be viewed on the German Film Portal and comes from the collection of the German Film Institute. Here are scenes from this film which we posted on our YouTube channel. After the capture of Belgrade in October 1915 by the Austro-German forces the Serbian army retreated to Albania, an event sometimes called the "Albanian Golgotha". During the long winter march of 1915-1916 the Serbs suffered around 150,000 casualties, including many soldiers who died from cold, starvation and disease. Covering the retreat with his camera was Samson Chernov. Chernov (1887‒1929) was a Russian cameraman who worked for the French film company Gaumont and became famous for his photographs of the Russo-Japanese War. He came to Serbia in 1912 as a correspondent for two Russian newspapers. During the second Balkan War he reportedly made two short films, After the Capture of Adrianople and The Battle of Bregalnica. In September 1914, the General Staff of the Serbian Army assigned Chernov as a cinematographer to the film crew of Djoka M. Bogdanović, owner of the cinema Kasina. Bogdanović - like Chernov a pioneer of cinematic war reporting - had produced films on the Second Balkan War, some of which have been posted on the Europeana Weblog. The crew filmed the events on the front near the Sava river, the city of Šabac in ruins, the crossing of the Serbian army over the Sava river and the destruction of Belgrade. According to Serbian film historian Dejan Kosanovic, Chernov's films got lost during World War I but a fascinating collection of still photographs taken by Chernov during the Serbian retreat to Albania has survived. Chernov recorded the epic ordeal of the long winter march while at the same time capturing the suffering with images of men wandering around and dying in the streets of hunger and exhaustion. Upon his arrival at Corfu, Serbian prime minister Nikola Pašić decided to send Chernov to Europe on a publicity tour. On June 5, 1916, in the gallery of the Royal Institute in London, he organized an exhibition on the Balkans in wartime since 1912. After America had entered the war Chernov also lectured in the United States. The website of the Wilson Center has this interesting article on Chernov's photographic work during World War I. In the collection of the National Archives we recently found a fascinating series of pictures featuring Albert K. Dawson who was captured while he was training the first official World War I cameramen in the United States in the art of war photography. These pictures were all taken in November 1917 shortly after Dawson had been commissioned a Captain in the U.S. Army Signal Corps. Captain Albert K. Dawson (left) and Signal Corps photographers, November 1917. 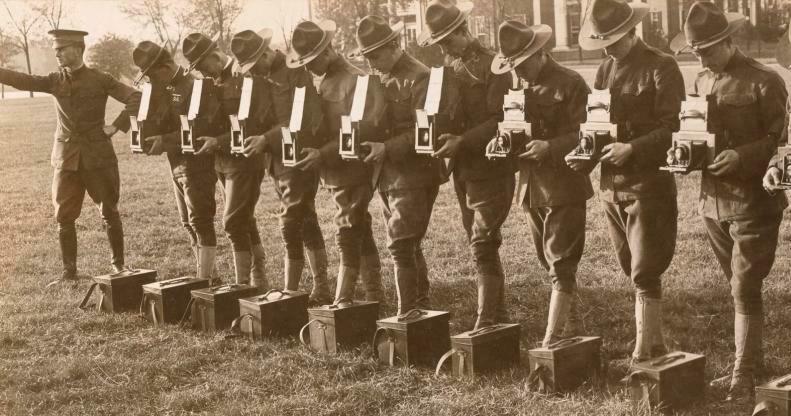 Soldiers learning to sight with 4x5 Graflex camera. Photograph copyrighted Brown & Dawson. 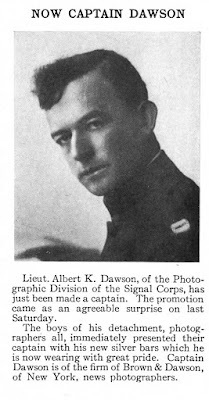 Born in Vincennes, Indiana, Albert K. Dawson (1885-1967) was one of the most enterprising cameramen of the First World War. Shortly after the outbreak of the Great War he went to Europe and filmed with the German army on the Western Front. In the summer of 1915 he joined the Austro-Hungarian forces during the attack on Russian Poland. He later covered the Bulgarian army in the Balkans. Dawson's movies were released in the United States by the American Correspondent Film Company in 1915-1916. We have described his film adventures in more detail in our books American Cinematographers in the Great War (2014), as well as Shooting the Great War: Albert Dawson and the American Correspondent Film Company (2013). Because of his recent experiences as a combat photographer Dawson was assigned to train the first official US cameramen. Before these photographers were sent to Europe Dawson gave them a crash course in still and motion picture photography. The Signal Corps had a slow and difficult start with this military photography program. It wasn't until January 1918 that at Columbia University a professional staff was set up for the first school of military photography and cinematography. From November 1917 Dawson trained his recruits at Washington Barracks and the photographs that we found were all taken at this location. 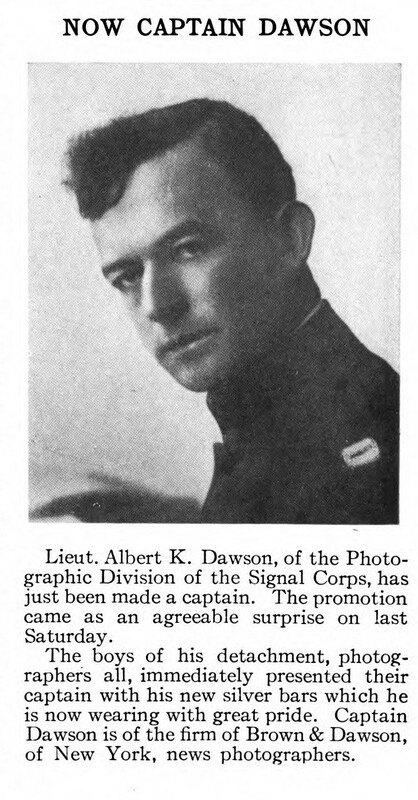 At this stage of the war Dawson had been promoted to Captain and as supervising officer he was assigned to the War College in Washington, D.C, where he was in charge of the Signal Corps photographic laboratory, handling the screening of all war-related pictures from France that were shot by military cameramen in the field. The photographs that we found seem to have been taken for the Commitee on Public Information, America's wartime propaganda agency. These pictures show Dawson teaching his soldiers how to sight with Graflex and Kodak roll-film cameras. The photographs all have a "Brown & Dawson" copyright, the photographic firm that he worked for. There is also an interesting picture in this collection, showing one of his recruits learning how to handle a 3A Kodak camera. The copyright reference on this picture has Dawson's personal handwriting. Another picture has an interesting reference to the U.S. Engineer's School of Photography at Washington Barracks. Apart from the Signal Corps the U.S. Army Corps of Engineers also sent soldiers to Washington Barracks for instructions in photography, as part of a course in military topography. Dawson may also have trained engineers at this place. As mentioned before in an earlier weblog, the National Archives is doing a terrific job digitizing its World War I collection and as a result these gems from the past are now available for the public just by accessing their website. Apart from Dawson and his squad of Signal Corps cameramen, this picture file at the National Archives also has a number of interesting shots showing American military cameramen training in aerial photography in World War I. We have uploaded these pictures featuring Dawson and his cameramen on our Flickr photo channel. 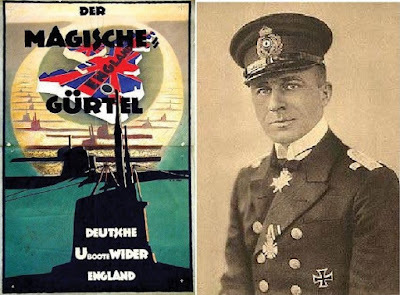 With 194 ships sunk, Lothar von Arnauld de la Perière was the most successful submarine ace ever. The German High Command, realizing they had a star performer in the Imperial Navy, in 1917 assigned a camera team to film his patrol of the U-35 in the Mediterranean. The result is an astonishing movie on submarine warfare during the Great War. Produced by the Bild- und Film Amt (BuFA), the film was approved by the German censor in August 1917 and subsequently screened in cinemas to wide acclaim. Ironically, the original German title Der Magische Gürtel is taken from a speech by Winston Churchill, First Lord of the Admiralty (1911-1915), who talked of liberating "our splendid Navy from the enchanted circle the [German] submarine has drawn around it." A camera team joined von Arnauld and his submarine crew for a five-week tour of the Mediterranean in the spring of 1917, filming events as 10 ships were sunk. All the footage was shot on deck, as apparently the cameras weren't sufficiently light-sensitive to film inside the submarine itself. There is strong emphasis on the proper treatment of the crews from the defeated vessels, which were only sunk once the crews were safely in lifeboats. "It was on this voyage that we had a movie man along. Poor devil! His face still haunts me. Pea green it was most of the time. You see, he had never before gone to sea on a submarine, and he was a sufferer from mal de mer in its most virulent form. Usually he stuck to his camera crank as a real film hero should. Shells and bullets and oncoming torpedoes could not drive him from it. But sea sickness did. There were times when he longed for a shell to come along with his name written on it, to end it all. Then, when Neptune waved his wand and stilled the rolling deep, that cinema man was a hero once more. If we got into a rough-and-tumble gunfight with an armed ship he would take his own sweet time and would coolly refocus his magic box and switch lenses as though it were a hocus-pocus battle on location instead of grim reality." The English would later use the movie as an anti-German film. A tinted version that fell into British hands formed the basis for the film's recent restoration by the Imperial War Museum. Unfortunately, this restored film version isn't available online at this moment. After the war, the Americans also got hold of copies. Rowland V. Lee, a former actor at the Thomas Ince Studio, captured a film print at the American Occupation Headquarters in Coblenz. The footage was first distributed in segments in the Hearst newsreels in November 1919. The theatrical release of this American version - renamed The Log of the U 35 - was in January 1920. The Library of Congress and the National Archives in Washington, DC, hold the orginal footage. The National Archives have a viewing copy of this American version, as well as part of the original German film which can be watched online here. The Library of Congress has some nitrate on the film in several collections. Here is a copy of the American revamp of this movie - The Log of the U-35- which has been uploaded on our YouTube channel. 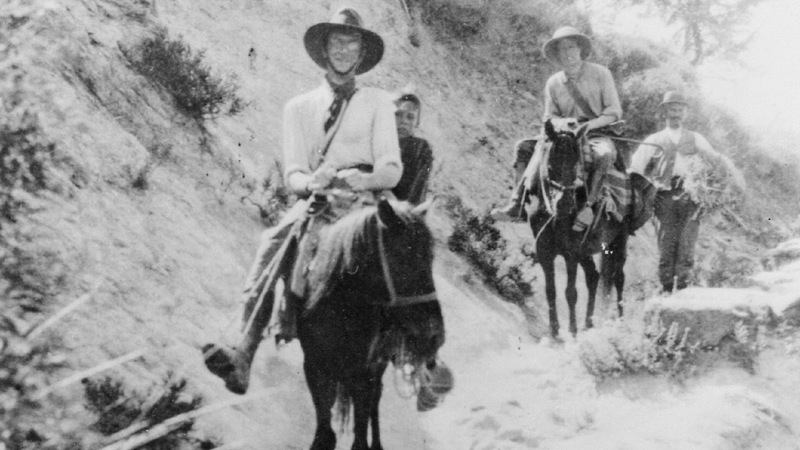 The only known contemporary film of the Dardanelles Expedition, Heroes of Gallipoli was shot in the summer of 1915 with an Aeroscope camera by British war correspondent Ellis Ashmead-Bartlett and photographer Ernest Brooks. It features intertitles by Australian war historian C. E. W. Bean. The historical film has been digitally restored by Peter Jackson, director of Lord of the Rings. Only 20 minutes of footage has survived, about one-fifth of the original 3000m of film, due to the unstable nature of early nitrate film stock. Because of its unique historical value the film has been listed on the Unesco Australian Memory of the World program, one of 60 similar programs around the world. A remarkable achievement in film making under difficult battlefield conditions, the movie was made at Imbros Island, ANZAC Cove, Cape Helles and Suvla Bay. It features Australian, New Zealand and British troops in military operations, as well as Turkish prisoners of war and excellent footage of the terrain. The film also shows soldiers in action in frontline trenches using periscope rifles—an Australian innovation—and remarkable scenes of a firefight and Turkish shells exploding in the enemy's positions. Cinematographer Ellis Ashmead-Bartlett (1881–1931) was the eldest son of Sir Ellis Ashmead-Bartlett who was Lord of the Admiralty. Sir Ellis’ interests took him to various theaters of war. At the age of 16 Ellis jr. accompanied his father with the Turkish army in the war against Greece and he served as a subaltern in the Boer War. He was a special war correspondent in the Russo-Japanese war, with the French campaign in Morocco and with the Italian army in Tripoli. In 1912 he was at the Turkish Headquarters during the First Balkan War. In 1915, Ashmead-Bartlett was eager to join the ill-fated Dardanelles campaign, also known as the Battle of Gallipoli, the unsuccessful attempt by the Entente Powers to control the sea route to Russia during World War I. The campaign began with a failed naval attack by British and French ships on the Dardanelles Straits and continued with a major land invasion of the Gallipoli Peninsula on April 25, 1915, involving British and French troops as well as divisions of the Australian and New Zealand Army Corps. Lack of sufficient intelligence and knowledge of the terrain, along with a fierce Turkish resistance, hampered the initial success of the invasion. Gallipoli turned into a military disaster that led to the death of 45.000 Entente soldiers. While Ashmead-Bartlett was in London, he paid a visit to his literary agent who suggested that he should take a movie camera with him for his return visit to Gallipoli. He started taking lessons before he left Britain and used the Aeroscope camera at Anzac Cove, Cape Helles and Suvla Bay, but it wasn't until he ran into war photographer Ernest Brooks on August 4, 1915, that he realized he had been operating it incorrectly. Brooks took over as camera operator after Ashmead-Bartlett survived a scare at Suvla. The original footage of Heroes of Gallipoli has been uploaded on our YouTube channel, as well as scenes from the restored version by film director Peter Jackson. In November 1914, the Ottoman Empire entered the First World War. The Turkish government was aware that propaganda activities were necessary to promote the war effort. The first step was to demolish a Russian monument in the suburbs of Istanbul and film the event so that it could be shown to a large audience. First an Austrian company was commissioned to do the filming. However later it was decided that such a patriotic event had to be filmed by a Turk. The task was given to Fuat Efendi, who was then under arms as a reserve officer. The problem was that while he had mastered film screening, Fuat Efendi did not know how to shoot film. It is told by several Turkish film historians that Austrian experts taught Fuat Efendi and on November 14, 1914, the Russian monument was demolished with Fuat Efendi recording the event. Thus the first motion picture shot by a Turk in Turkey was made. In 1915, during his visit to Germany, the minister of war, Enver Paşa, watched footage taken by the German Army for purposes of propaganda and training. The Germans had even made a film of Enver’s visit to a shooting range in Germany. 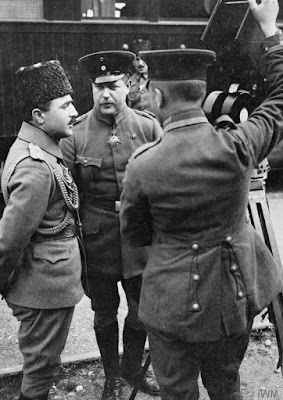 Deeply impressed by what he had seen, Enver Paşa ordered the establishment of a cinematography branch in the Ottoman Army, modeled after its German counterpart. The Central Army Cinematography Office was established in 1915. In its early stages, this office shot footage which was not directly related to military propaganda. Some of the first films were titled Enver Paşa’s Horses and The Newly Born Child of Enver Paşa’s Wife. Apart from meeting Enver Paşa's demands for self-promotion, these early films seem to have little historical value. The Army Cinematography Office was dissolved in 1918. During its short life, it managed to produce a significant number of documentaries and newsreels, using mostly camera equipment from Germany and Austria. As described in our book, American Cinematographers in the Great War, the Germans were particularly interested in showing war films in Turkey to boost public morale, and in 1916 they sent Hearst cameraman Nelson E. Edwards to Constantinople (Istanbul) to cover the Turkish side of the war. The website Turkey in the First World War has more on these early films.